Explanation: A brilliant Jupiter shares the sky with the Full Moon tonight. Since Jupiter is near opposition, literally opposite the Sun in planet Earth's sky, Jupiter will rise near sunset just like the Full Moon. Of course, opposition is also the point of closest approach, with Jupiter shining at its brightest and offering the best views for skygazers. 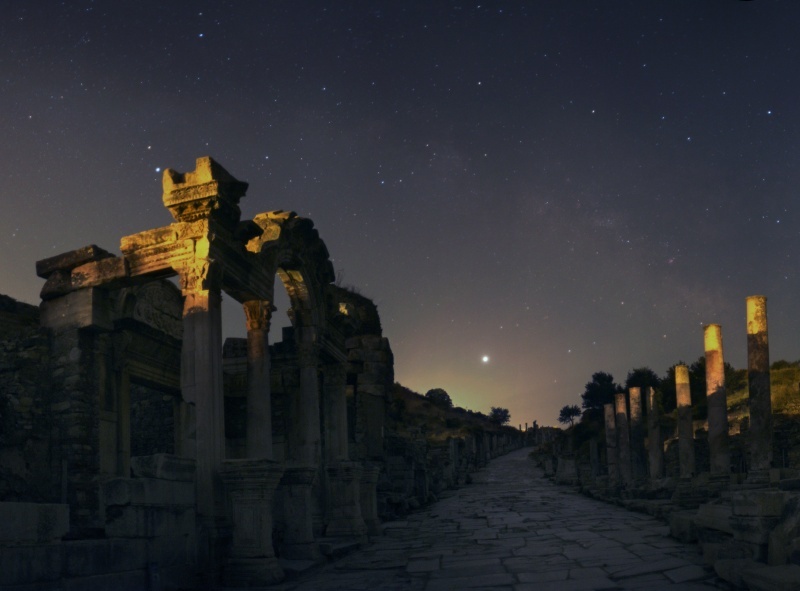 Recorded late last month, this moving skyscape features Jupiter above the southeastern horizon and the marbled streets of the ancient port city of Ephesus, located in modern day Turkey. At the left is a temple dedicated to the Roman emperor Hadrian. The beautiful night sky also includes the arc of the northern summer Milky Way. Lights on the horizon are from the nearby town of Selçuk. Clicking on the image will download the scene as a panorama.